I'm linking up with Blog Hoppin' to share a technology tip! Towards the end of the the last school year, I discovered this really cool website called Tizmos. It's a kid (and teacher) friendly visual bookmarking site. It captures visual images of websites so members can access their bookmarks from any computer. 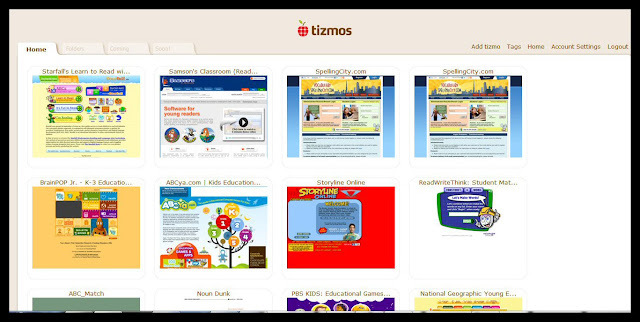 As a teacher, all you need to do is add the websites your students frequent to the Tizmos homepage. Then, when your students want to go to a particular website, all they need to do is click on the image. It's that easy! Here is a screenshot of what my Tizmos homepage looks like. My students were always able to find the sites they needed without my assistance. I received an email from the Tizmos crew, letting me know that they are improving their screenshotting capability so all of our thumbnails are available. That is great because, as you can see in my images, there is one game that does not have a thumbnail. They also said that they are designing a premium version that will have some pretty fancy features. I am really looking forward to getting more information about this! I hope you like Tizmos as much as I do! I try very hard to respond to every comment I receive and I'm still finding lots of no-reply bloggers. If your email is not associated with your blogger, then you cannot receive emails from bloggers. For step-by-step directions on how how to fix this issue, you can click here. Don't forget to leave a comment on THAT post so I can check to see if you have fixed your settings properly. If you don't hear from me, then it probably wasn't fixed. Oh, one more thing! Kinder-Craze has a really good tutorial on how to disable the word verification box that pops up when people try to leave comments on many blogs. Most bloggers don't even realize that this is happening. There are so many times I want to leave a comment and then the pesky box opens up and I literally click right out of that person's blog. Please, please, please, click here to get rid of that box once and for all. Thanks so much from me and every other blogger who finds it almost impossible to read the letters and numbers in that annoying little pop up! Tizmos is fabulous! Thanks so much for sharing it with us! This will be perfect for bookmarking online math games for my math centers! Lori, I really appreciate all thehelp you give to new bloggers. Thanks for the information. I'll have to check Tizmos out. Hopefully our school website won't have it blocked! Thanks again Lori for always sharing such great ideas. I've always used sqworl to bookmark websites, I've never heard of Tizmos. It sounds like it has more of what I will need. YOU ROCK (as always)!!!! Thanks, Lori! I'm excited to check out Tizmos and get it set up for my kiddos this year. That is awesome! I am definitely trying this out. I've never heard of that site! Can't wait to try it! Thanks for sharing! Never heard of Tizmos, but what an awesome idea. I'll definitely be looking into that. Thanks! This is great! I am going to go check out Tizmos. 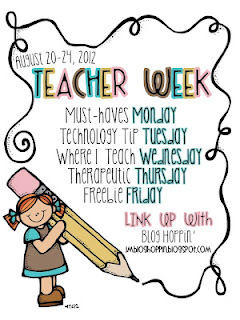 Come on over and linkup your technology tips!